The St. John’s men’s basketball team secured a commitment from NC State transfer Ian Steere, the latest part of what looks like a stellar roster for the 2019-20 season. Steere, a former four-star recruit, will enroll at the University next semester and be eligible to play at the conclusion of the fall 2019 term. 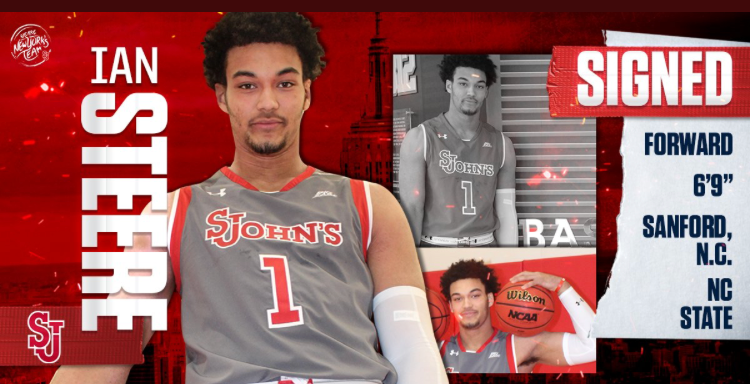 “We are excited about Ian’s decision to join the St. John’s men’s basketball program,” said St. John's Head Coach Chris Mullin. The 6-foot-9, 260-pound forward played in one game this season as a freshman for NC State, scoring four points, along with four rebounds and one assist in five minutes of action during the Wolfpack’s campaign-opening victory of Mount St. Mary’s on November 6. Prior to enrolling at NC State, Steere starred for Wesleyan Christian Academy, where he led the team to a 28-5 record and a runner-up finish in the NCISAA 3A State Championship as a junior. He was a teammate of current St. John’s sophomore David Caraher at Wesleyan Christian and on the AAU circuit with Team Charlotte. Steere, who attended Northwood Temple Academy as a senior, was a four-star recruit according to ESPN, Rivals and 247Sports. Rivals counted Steere as the 138th recruit in the high school class of 2018 while the 247Sports composite rankings had him two spots back at 140.